It wouldn't be a stretch to argue that the American standard, “Blue Moon,” has had one of popular music’s most convoluted and remarkable histories, beginning with its genesis in the early 1930s. It's assumed to have been penned by Richard Rodgers and Lorenz Hart (melody and lyrics, respectively). But unlike each and every one of the prolific duo's many other songs, it wasn’t written for a play or a movie. Instead, it was a stand-alone—indeed, their only stand-alone. The pair was under contract to Metro-Goldwyn-Mayer during what one writer calls their “disastrous Hollywood period in the early 1930s.” As successful young Broadway producers in the 1920s and native New Yorkers—at ease on the subway and the short walk from apartment to theater—they found their follow-up gig in Tinseltown to be, as the writer puts it, “an endless series of compromises and frustrations; most of what they wrote was never used. . .prompting perhaps that famous line from ‘The Lady Is A Tramp,’ ‘Hates California, it’s cold and it's damp.’” Heck, they didn’t even drive. The story goes that MGM had asked them for a song for Jean Harlow for the movie Hollywood Party. "Oh Lord, Can You Make Me a Star,” in which a young girl prays for fame to the melody of “Blue Moon,” was neither used nor recorded. As MGM’s Song #225, “Prayer (Oh Lord, make me a movie star),” dated June 14, 1933, it was registered for copyright as an unpublished work on July 10, 1933. Hart, the story continues, wrote a new set of lyrics for the same melody for the 1934 film Manhattan Melodrama. Entitled “It’s Just That Kind of Play,” the song was cut from the film, and registered for copyright as an unpublished work on March 30, 1934. The studio then requested a nightclub number for the film. Rodgers still liked the music, so Hart wrote a third set of lyrics: “The Bad in Every Man.” It was sung by Shirley Ross and released as sheet music. It wasn’t a hit. In stepped MGM publisher Jack Robbins, who, according to the writer, “saw its commercial potential and pleaded” with Hart to write a “less depressing lyric.” This fourth rendition became “Blue Moon” as we know it today. It’s a song whose lyrics, of all of those in the exemplary Rodgers and Hart repertoire, are considered, as the writer puts it, “either Larry Hart’s simplest or most banal.” Nary a hint of the clever rhymes that are the lyricist’s hallmark appears in this song. Which they, in fact, were, because the lyrics—at least in the version we know today as “Blue Moon”—weren’t written by Hart, nor was the melody penned by Rodgers. Rather, the song was composed in 1931 by a 17-year-old, the son of Polish immigrants, in Troy, on the East bank of the Hudson River in upstate New York. His name was Edward W. Roman. You Wrote Blue Moon, Didn't You? I know because I am his daughter and because I have always known this story. It’s been a part of my family for all of my growing-up years, the source of whispers about “that ‘Blue Moon’ thing” among the adults—clearly, it was a sore spot—permeating our family gatherings, a matter of curiosity among the more curious of the youngsters, of which I was perhaps the most curious. I was typically the first to be angling up to the perimeters of such conversations: that Ed sold the song for $900 to buy a car; or was it that he “settled for” the $900 to buy the car. I’d always been proud of it. I remember blurting it out—“My father wrote ‘Blue Moon’!” I exclaimed to a bewildered gaggle of 18-year-olds in my freshman dorm at the women’s college I attended in the late 1960s. We were huddled together in a room, confessing our deepest secrets. Mine wasn’t one they expected or could understand. Subliminally, I’ve always wanted others to know about it. I wanted it to be "out there" and wondered why it wasn’t. I'm more convinced now that it should be, because I can no longer be assured that without my intervening it will be—one of these days. It’s more critical than ever that an understanding of the era, the 1930s, and the people who shaped it be based on fact rather than conventional wisdom. A scholar of any discipline would demand as much. I’d been privy in those whispers of my childhood to the grittier details. At a point in the 1930s when my father’s involvement with the song was over, my Uncle Chris, the third of the nine brothers and sisters on my mother’s side—the family name was Brignola—and the most vocal and aggressive, had stormed up the back stairs to the second floor of the brownstone on Fourth Street where my mother, Mary, lived with her parents. Chris broke down the door—the crack was still there when I’d climb those same steps after school in the 1950s to our flat on the third. He was looking for my father—Mary’s beau at the time—threatening to kill him when he found him. “Go up to the attic,” my Uncle Chris said to me at the family gathering following my father’s funeral in 1992. I knew the stories but not the facts. Maybe he knew that, too, and wanted to fill me in. Or maybe he was in a reflective mood on that sad occasion. But it was he who approached me—unusual because, after all, for the longest time I’d been a kid, not an equal. He’d tweak my cheek. But now I was 44, packaged in a slim dark suit and serviceable pumps, my hair tied at the nape of my neck. We were on the second floor of a brownstone on Third Street, around the block from the Brignola family home. It belonged to my Aunt Margaret, my godmother and my Uncle Briggy's widow. The oldest of the nine, Briggy had died two years earlier. My husband, an attorney, was working the room, bantering with relatives, a backhanded way of assuaging his own deep grief. Our 11-year-old daughter frolicked in a flowing dress—maybe relatives were tweaking her cheek now. Our two-year-old son was with my in-laws, 40 miles away, just over the Massachusetts border. For all of the whispers and stories, I didn’t know much more than that about the “Blue Moon” saga by the time of my father’s death. I knew only that it might have had some connection to a car, which made sense because, as in many immigrant and working-class communities of the early and middle decades of the 20th century, the car was the ultimate symbol—of success, prosperity, having “made it,” freedom. Not many immigrants owned one in the early years; certainly not my grandfather on my mother’s side. He’d been a prominent tailor in town, and he’d bike to his shop. 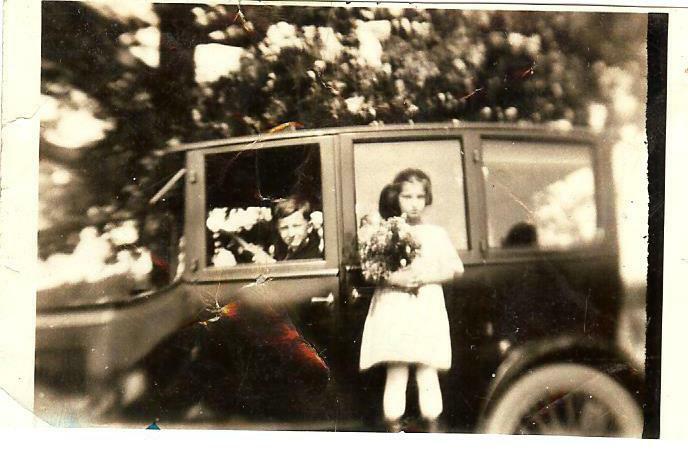 My grandfather on my Polish side—my father’s father—had, however, the means to buy a car, as far back as the 1920s, and, in fact, may have traded them in regularly. He had a well-paying factory job; was frugal—to a fault, my mother would say; and had the good sense to limit his family to two children—my father and his younger sister Niel—as opposed to the nine on my mother’s side. It’s not surprising, then, that cars had captivated my father. In family albums from the earliest years, he had carefully placed pictures of himself and Niel as children seated in (or standing outside of) a car with a running board. In another, they are standing in the foreground—the car itself lies in the distance, like a promise, or a distant dream. 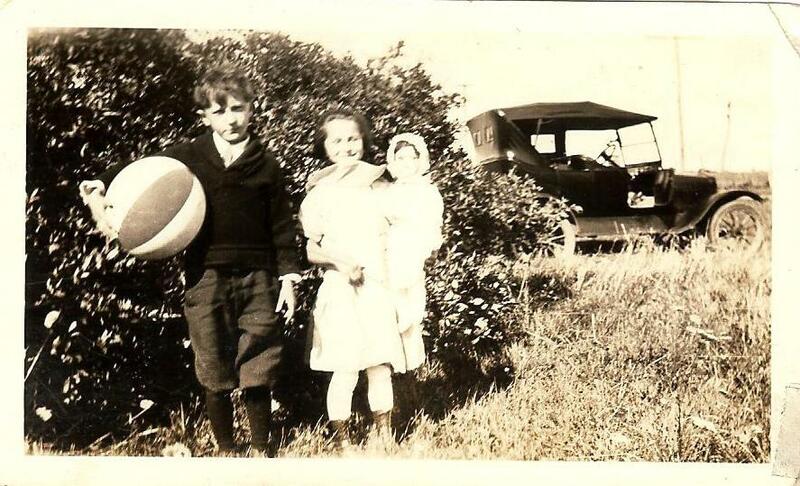 My father is holding a humongous ball; Neil with her equally large doll is to his right. By the 1930s, he’s elongated against a car that’s identified in a related photo as “The DeSoto” that he’d always talk about. Could that have been the car he sold the song for $900 for? Or “settled” whatever it was he had to settle for? He’s wearing a short-sleeved white tee, a young man, lean and happy and squinting into the sun. I think back to the 1950s when I was a child. Every two or three years, he’d trade in the Chrysler for a model that was sleeker and longer and with sharper-looking fins than the one before. Along with his cameras—the Rolleiflex and the Leica—and the formidable equipment he’d bought for the darkroom that he had set up in the pantry to feed his other passion, namely photography, the car was his most valued possession. "You Wrote 'Blue Moon,' Didn't You?" Once I asked my father directly about “Blue Moon.” This was when I was nine or 10 or 11. I wasn’t yet 12, because the decade hadn’t turned. It was still the 1950s. Childhood memories are elusive, this one being no exception other than I remember several specifics about it. I remember being captivated by a drawing my father had sketched, colored, and placed in the corner of the mirror over his dresser. It was of an antique car with a running board; and the coloring was exquisite, the pale blues and pinks and greens evenly coating the surfaces, each hue contained within its allotted space. As a budding artist, I was impressed because I hadn't yet mastered coloring within the lines. I sensed because of such examples that he liked things done properly. And the song was a serious matter to me; I guess I had heard one too many whisper. So I suggested we converse in the easy chairs in the living room. I folded my hands in my lap, and sat up straight. “You wrote ‘Blue Moon,’ didn’t you?” I said. I mumbled something about having heard the stories. He replied by telling me a story of his own: that when he was young, he’d race at night on Burden Pond in South Troy, the city's Polish neighborhood. And that much rang true because he still had his long-bladed racing skates with the black boots. He’d take my sister and me, and sometimes our younger cousin, skating on Sunday afternoons on another local pond. He’d taught us how to skate. And he drew a circle with his hands as if designating how a long-ago vision had become a piece of artistry that had endured for decades. Richard Rodgers had been furious, or so went the scuttlebutt in the published reports. I’ve often wondered what my father thought. I was 13 when that version came out, and I loved dancing to it even as what they had done to the song itself unnerved me. “Blue Moon,” in my mind, was Mel Torme’'s 1940s version, “The Velvet Fog” assuring that the song would transcend the modest success it had on the Big Band circuit in the 1930s and chart for the first time. Or, in the '50s, the sultry and seductive versions by Sinatra and Billie Holiday, Nat King Cole and Jo Stafford—the list goes on. Rosie Clooney. Ella Fitzgerald. Tony Bennett. These were the voices from my parent’s generation that spilled into my own. And even Elvis. His darkly evocative rendition produced by the legendary Sam Phillips didn’t include the “bridge,” the part that begins: “And then suddenly there appeared before me. . .” and the moon turns to gold. Some of the best covers I’ve heard don’t. See: "Elvis and Ella Fitzgerald Sang It. She Says Her Father Wrote It," The New York Times, September 16, 2018. Of the circumstances surrounding my father’s authorship, I’ve wondered why I hadn’t a clue as late as into the 1990s when my father died, and my Uncle Chris had said: “Go up to the attic.” I suspect it had a lot to do with family, if only because family had been the most formidable force in my growing-up years; had been, in the years before I was born, the central unifying element of my parents’ lives. On my father’s side, I could see in the Romans where his artistic inclinations may have come from, his careful attention to the stunning photographic enlargements he turned out—in beautifully rendered sepia tones of blue and green—from that darkroom. I recall my grandmother’s thrill at finding an exquisite teacup or trinket for five cents at a flea market, turning it over lovingly in her hand as she admired it; sure, offering it to my mother if she liked it, too, but only if my mother had the five cents. It would make my mother boil; not a meal—nay, not even a cup of coffee—was offered in that tiny house on a hill where they lived when I was a child, my mother would say, seething. My Aunt Niel, too, perfectly—exquisitely, really, for she looked like a model—put together in the simplest of pieces: a long slim skirt, a sleeveless white blouse, a stylish coat or shoulder bag making it an outfit, the whole greater than the sum of its parts. Or later, when she left Troy with her husband, an engineer who worked on construction projects throughout the country, and would send to us paintings she had done in oil. One was of my sister as a little girl seated on a hassock; many were of fruits and flowers. She’d been a devotee of Jackie Kennedy, I later learned when cleaning out her belongings after she died in 2009. And I could see why, given that former First Lady’s exceptional taste and sense of style. My aunt had clipped articles about the way Jackie dressed, and had decorated and entertained in the White House. I could see my way clear from this pattern of visual artistry to the flat on Second Street in South Troy where my father had, long ago, composed the poems that I found after his death. He had placed them in a beautiful but now tattered leather-and-cloth portfolio. The poems extended into 1935 and 1936, and mostly depicted the yearnings of a young man for, as his famous song went, “a love of my own.” About a fourth contained references to the moon, or drew upon the moon as a central image. He had typed what he thought were his “best”; first drafts of those winners, plus others, many only a line or two, were handwritten on scraps of paper. He’d placed the typed poems in a ringed binder and entitled the collection Thoughts. It was dated March 17, 1936. On my mother’s Italian side, music lay at the center of the personal, if not professional, lives of these relatives. My grandfather played the mandolin at home; in the Italian community band, he’d march in the parades with his tuba. 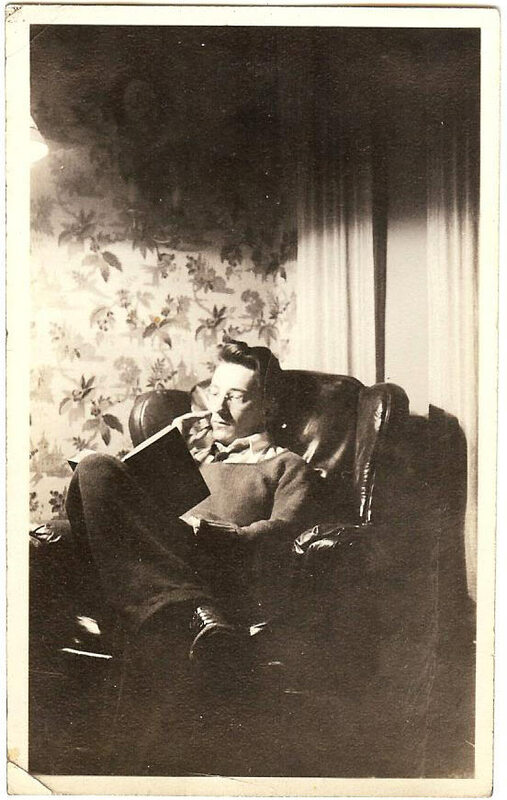 My Uncle Briggy—my godfather—had been groomed by my grandfather because he was the oldest to become a doctor, and in doing so, lift the fortunes of the family. But Briggy played an instrument: the guitar. At the saddest of events, he’d play—I remember wishing he were there for my father’s funeral. At my mother’s, in 1984, he had strapped his guitar across his compact frame and strummed slowly, “If you are among the very young at heart.” We’d barely been able to sing, and even he realized that, as the song hadn’t come quite to an end when he quietly put down the instrument. Even my Uncle Chris played, albeit rarely—I’m trying hard to remember when I last heard him do so, and I cannot. His instrument was the banjo. There's irony, given what eventually happened to the song, in the shaky tie between the Brignola avocation and the artistry of the young man—my father—who was, in 1938, to marry the second oldest of the nine, my mother, Mary. They met, my father told me on the night she died, at a dance, which must have been in the spring of 1935, because it is shortly thereafter that pictures of her begin appearing in the family album. She was leaving the dance in a car, he said, and he ran up to the window. “It wasn’t love at first sight,” he said. But he did take many pictures of her—some with his arm lovingly around her shoulder, which meant he’d have to set up his tripod. And he bought her a radio, because he knew she loved listening to the radio. He was proud of that radio, which by the 1980s, he kept tightly wrapped in a box in the attic. He would stress that it was “worth something,” $800, $900. It was there when I cleaned up, a beautiful alabaster green. I took it out of its box and placed it on a table in my home, where it remains to this day. Embracing Mary, though, meant embracing her family, an entangled web of brothers and sisters whose relationships with each other were similarly entangled. At the top of the heap were Briggy and Mary, the oldest boy and girl, born in the first decade of the century. Together they functioned as a second set of parents, not so much to Chris or Jim who came next, but to the five born in the late teens and early 1920s: Care, Jo, John, Rose, and Dom. The youngest, aside from Rose who died from a brain tumor in 1933, aligned with each other as they came of age in the War-ridden 1940s. Dom and John, in particular, given that both enlisted, Dom in the Navy and John as an Army medic; they’d get college degrees on the GI Bill. As vets, if not as college grads, they’d find communion with Jim. A cutter in Troy's Cluett Peabody factory—renowned for its “Arrow” brand of men’s shirts—Jim had joined the Air Force. It was the high point of his life. Dom and John became school teachers, of physical education and social studies, respectively, intersecting with Jo, whose degree in math from a local college made it possible for her to teach at the high school. But the alignment of Briggy and Mary matters most in this story. My grandfather’s insistence that Briggy become a doctor meant that Mary would have to go to work at Cluett after eighth grade rather than enter high school. Even the three mortgages that my grandfather took on house wouldn’t be enough to put Briggy through college and medical school. All of which cemented an alliance forged in childhood. They’d grown up in the teens and the ‘20s when only Italian was spoken in the household, which wasn’t the case when the younger ones came along. They were close in a special way that continued when Briggy’s wife, Margaret, and my father entered the picture. So that it became Briggy and Margaret, and Mary and Ed. In a smart-looking photo from the ‘30s or ‘40s, the couples are seated around a table at what I’d later learn was an upscale nightclub and theater restaurant—Dinty’s Terrace Garden—that featured live music by national acts: Briggy, with his taut frame and dark mustache looking a little like Cesar Romero; Margaret, aglow in her silk jacket; Mary and Ed, comfortable as part of the foursome; all of them having such fun. By the mid-1940s, Briggy, stressed by a general medical practice that attracted a sizable chunk of Troy’s Italians, began taking extended winter vacations in Florida, six weeks to start, and eventually, two or three months. At first, he and Margaret would take their son Nicky—who was nine or 10 or 11 at the time—and my mother and father would go along. I smile when I see those pictures of them at the beach or visiting Washington, D.C., on their way home. “Nicky” was my favorite cousin: I knew him as that little kid who, my mother used to say, would eat nothing but the rolls at restaurants, when, in fact, the world would eventually know him as Nick Brignola, one of the finest of his generation on the baritone saxophone, a star in the sub-genre of modern jazz. After those early years, when his parents no longer wanted to take Nicky out of school for the Florida trip, they would leave him in Troy to stay with my mother and father. My father bought him a BB gun and taught him how to shoot. And just as my Uncle Briggy and Aunt Margaret were my godparents in Baptism, my father—Nicky's Uncle Ed—served as his sponsor in Confirmation. Chris, in many ways, was the odd man out; Care, too, albeit yin to Chris’s yang. 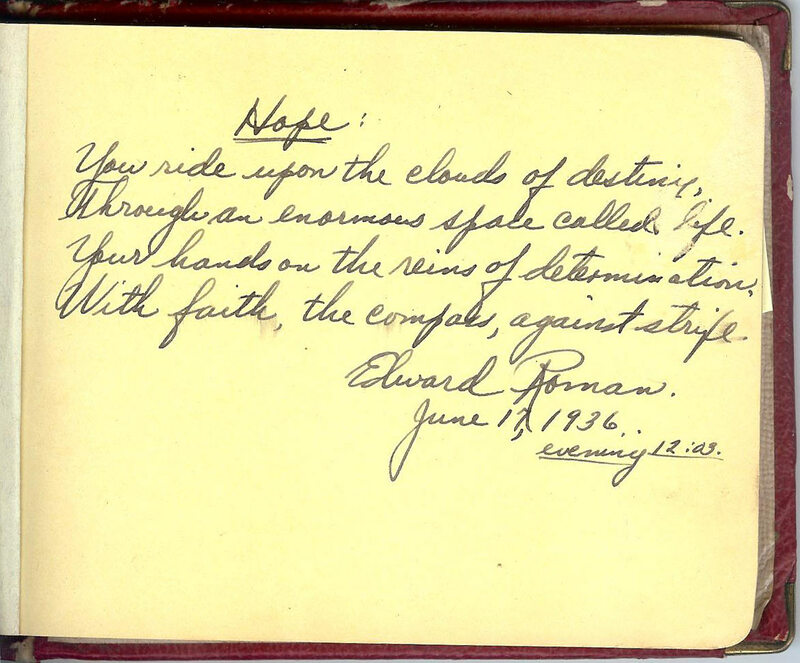 On the occasion of Care’s high school graduation—as Valedictorian—in 1936, my father penned a poem called “Hope” for her. “You ride upon the clouds of destiny/” it began, and, indeed, she had at least set off on such a ride: Cornell; and with Briggy’s financial help, medical school; fellowships to the great pediatric teaching hospitals in Philadelphia and Boston. She touched a world that even Briggy would never know. As for Chris, Briggy’s inverse and antagonist, this second son didn’t benefit from a father pushing for his education. My grandfather had nothing left for the others after paying for Briggy’s. In his thirties at the outbreak of World War II, Chris, unlike Dom and John and even Jim, was too old to enlist. He had left school, as did many young people in those days, but in his case possibly before finishing eighth grade. The records don’t show that he entered high school. He began learning the trades from his uncles. He worked as a plumber and knew how to wire a house. But because he was intelligent and clever, he also set about making his living in ways that weren’t prosaic. I know that he had a job at a plant, was maybe even the union boss, but I cannot to this day say which one—the name American Locomotive lingers in my memory; later, he bought property and rented out flats. “Making trouble,” the adults would say of him, if only because of the way he pushed and pulled for what he wanted—demanding from Briggy the down payment for the house he bought for his own family, to take one example. And also because of the way he lashed out. In a physical fight with Chris, Jim lost his hearing in one ear. Chris’s own young son would rush to his grandparent’s house down the street to avoid his father’s blows, which eventually prompted Briggy to step in. Into those entanglements parachuted my father: the ice-racer whose interpretation of a moon’s blue reflection on a pond would become a work of musical artistry that captivated generations; the writer whose poems floated like gossamer on scraps of paper; and, I’d eventually learn, the composer whose lyrics he’d pair with melodies to create other songs. “Your father played the trumpet,” my Uncle Chris told me at the funeral in 1992. That was the first time I'd ever heard that. Chris said my father would play on the balcony of the second floor of the tenement where he and my mother lived when they were first married. It was called “The Boathouse,” and was torn down. ”And he’d play on Havermans Avenue,” my Uncle Chris said. This made sense because Havermans straddled the edge of the hill leading up to Prospect Park and Troy’s elegant East Side. You’d have the space to yourself on Havermans. It was in the attic and from my Uncle Dom, the youngest of the nine, that I was able to piece together a coherent whole from the scraps of information. My Uncle Dom and I had lunch in 2006. I invited him specifically to talk about the family's role in “Blue Moon,” and he didn’t mince words. He was only a kid then—nine or 10 or 11—and my father and mother would take him for rides in the country in the summer and to go swimming, he said. He’d have to sit in the rickety rumble seat in the back of the car. “Your father,” my Uncle Dom said, “definitely wrote the music and maybe the lyrics.” He had gotten chummy with Chris after meeting my mother. Chris had heard the song on the radio; had learned that the sheet music alone had racked up $75,000 in sales in the first year; and insisted they sue. My Uncle Dom said Rodgers and Hart called my father, offering to settle for $1,200. He accepted but didn’t tell Chris, which led to Chris’s breaking down the second-floor door on Fourth Street and punching my mother, demanding to know my father’s whereabouts. I asked about the figure being the $900 that I had heard in my youth. But my Uncle Dom countered, no, it had been $1,200, two or three times what most people earned in a year in those days. A decade later, in 2016—after Dom and, in fact, all of them had died, and my cousin Nicky as well—I had a similar conversation with Nicky’s widow, Yvonne, whom I cherish. I'd been devastated by Nicky’s death; had turned for solace to our last telephone conversation when he said of his cancer that he’d “fight the good fight.” I clung to memories of happier times, remembering how I’d once run into him in downtown Troy in the ‘80s and he’d told me he was off on a new adventure. Europeans had taken to modern jazz, he said, and he’d be touring the continent. I wished him well, and was bursting with pride. Yvonne said that Nicky had often told her that my father wrote “Blue Moon,” probably not the bridge that goes “. . .and then suddenly there appeared before me. . .”—the part that some artists such as Elvis bypassed in their covers. Which makes sense considering the lyrics were the yearnings of a very young man, which my father had been when he wrote it, “. . .standing alone/without a dream in my heart/without a love of my own.” Indeed, it’d be four years before he’d meet Mary. But he did write the song, Yvonne stressed; and he sent it to a New York music broker, carefully mailing a copy to himself that same day so that the postmark would serve as proof. The physical evidence emerged from the papers in the attic, where I headed shortly after my 2006 lunch with my Uncle Dom. From that same portfolio that contained my father’s poetry, I found a detailed newspaper clip, dated October 21, 1936, and published in a local paper that I had always regarded with fondness even though we didn’t subscribe. Confirmation of my father’s prowess on the trumpet—and, as I would soon learn, the French horn and violin as well—came from that article in The Knickerbocker Press. He had been playing the trumpet for five years with local orchestras, the article said, which left me breathless because that meant his playing was not only on the balcony of the tenement or on Havermans Avenue, but also in bands, meaning in public settings, and going back to 1931, when he had presumably written “Blue Moon.” I recalled from a visit to the Rensselaer County Historical Society its historian saying that dances—and therefore bands—proliferated in the 1930s: at churches and fraternal organizations; in nightclubs and roadhouses and swank hotels. It’s how people met and mingled back then, she said, they went out. That article and three others from local newspapers concerned what I had suspected all along: that my father had, in fact, brought a lawsuit regarding “Blue Moon.” Against Rodgers and Hart, Metro-Goldwyn-Mayer, and MGM’s publisher, Robbins Music Corp., whose principal, Jack Robbins, had spotted the song’s commercial potential; and against another Jack—“Jack Mahoney doing business under the assumed business name of Mahoney and Associates”—in New York City. It was Jack Mahoney who had offered to broker it for my father. In the feature in The Knickerbocker Press, there’s a picture of my father, young and slim and serious and handsome, in his trademark wireless glasses and wearing a jacket and tie. He’s seated and holding a document with his attorney, E. Stewart Jones, which also catches me off-guard because the Jones firm had been, since its founding in 1898 and continuing into my own day, one of Troy’s most prominent. Jones, appearing in the photo to be about as young as my father, was a graduate of a private high school for boys and the exclusive Williams College. That such a firm took my father’s case, I believe, says a lot about its merit. The article describes my father as a 24-year-old Troy musician—he was actually 22 in 1936—who had written “Blue Moon” after, as he had intimated when I was child, “an evening of skating on a moonlit pond in the southern section of the city.” The story says he sent it “at the suggestion of friends” to a broker; heard back within a few days with an offer and a contract, which he never signed. “They continued to write to me at intervals, sending me contracts to fill out and make them my agent,” he says in the piece. Months, then years passed; nothing more transpired until he heard from a “friend” late in 1934 that the song had been published and played on the radio. My father didn’t think to do anything about it because, the article says, he figured that, with MGM now having a copyright on it, he had “forfeited his rights.” Upon learning that as an author, he had, as the article puts it, “a property right. . .and legal redress against those undertaking to realize profit in its publication without his authority,” he decided to take action. It was in those papers in the attic that I located a document that served as support for the many stories and whispers and pieces of information that had come my way throughout the years. It was the letter from Jack Mahoney to my father, along with the official contract, proposing to broker “the number” my father submitted, and advising that the copyright would be in my father’s name. The letter, four half-sheets of single-spaced prose, spoke in gushing terms about the song’s potential. The songs were the third leg of my father’s artistic stool. I’ve been asked by some to whom I’ve told this story: didn’t the writer of a song as eternal as “Blue Moon” write other songs? And to that question I would have had to answer, before I went through the papers in the attic, that I didn’t know. Truth be known, I didn’t think to ask throughout all of those years. In a letter of agreement, they agree that Dutton was to write the melodies and my father the lyrics, although some of the songs appear with my father’s name—and even, in a few instances, my mother’s—on the music as well. Two appear to be complete: “Am I Really in Love?” which I would later learn Dutton copyrighted in 1936, both the melody and lyrics; and “All Because of You,” on which he copyrighted the music. For the former, my father wrote a second set of lyrics, “I Am Really in Love,” as if the song were to alternate between a question asked and answer given; for the latter, he wrote the lyrics. A receipt from Dutton acknowledges this. A set of lyrics by my father for a third song, “I Gambled and Lost,” for which Dutton is credited on the music, appears; but there is no music. Sheet Music for "All Because of You"
I rack my brain to this day about why no one other than Chris came forward for my father. If one were to fill in the blanks, I would argue that Chris alone spotted what it meant for the song to be played on the radio; only he had the wherewithal to insist that something must be done. In the court papers from 1936, a summons was attempted to be served on Mahoney at his “place of business,” only to be rebuffed by an office operative. Mahoney wasn’t in, the operative said. But he was. A photo had been taken of Mahoney, and a person right there in the office, the court papers said, resembled that likeness. I have to think that Chris, alone among those whose lives touched my father's at that time, would have understood Jack Mahoney. I’ve wondered a lot about Briggy, given the lifelong tie between Briggy and Mary, and their spouses; and also given Briggy’s connection to the young E. Stewart Jones, a contemporary at the Albany professional schools—Briggy in medicine, and Jones in law. But not a shred of evidence of any involvement on Briggy’s part exists in the papers. If I were to speculate, I’d say the "Blue Moon" matter must have at least crossed Briggy’s mind because of something else in the papers from two decades later, in 1958, when Briggy’s son confronted a similar fork in the road. Nicky had been enrolled at Ithaca College, and was jamming with a talented group. They’d played at Café Bohemia in Greenwich Village; and its legendary owner, Vince Garafolo, thought the world of him. “By this time you no doubt know Nicky quit college,” Briggy wrote in a letter to Care. I wish I were witness to what had happened in that year and a half when Jack Mahoney—and I’m presuming now—sent the song to MGM; and the movie studio, presumably impressed, foisted it upon its increasingly dispirited hired hands, Richard Rodgers and Lorenz Hart. “Hates California, it’s cold and it’s damp/. . .” And upon Jack Robbins, who had the good sense—heck, they all did, not only Robbins, but also Mahoney and MGM, Rodgers and Hart—to realize its beauty, and in the case of Robbins, its potential in the marketplace. But I wasn’t. So I don’t know; and any documents from their point of view are, again presumably, locked up somewhere in MGM’s files, off limits to the public. In the mirror I could see my father’s reflection. He wasn’t shying away from the song; he was, as we’d say today, “leaning in.” Intently, reflectively. By 1961, his nephew, Nicky, was making it as a saxophonist in the Village and in wider modern-jazz circles. And his little daughter was now a teenager, a collector of gold stars, and on her way. Brignola, Carolyn Veronica, M.D., Autographs, 1936. Brignola, Nicholas Frank, M.D., Paper, January 12, 1931; Letters, 1940-1990. Dutton, Henry R., “All Because of You,” melody in Dutton’s hand, personal communications, 1936. Dutton, Henry R., “A New Star Was Born,” melody in Dutton’s hand, personal communications, n.d.
Dutton, Henry R., “Are You Really in Love?,” melody and lyrics in Dutton’s hand, personal communications, 1936. Dutton, Henry R., Letter, October 22, 1936. Dutton, Henry R., Letter, December 5, 1936. Dutton, Henry R., Receipt, November 29, 1936. Gallese, Liz Roman, Journals, Papers, 1958-2018. Koch, F.L., Letter, October 2, 1933, The H.N. White Co.
Mahoney, Jack, Letter, January 12, 1932, Jack Mahoney and Associates: Publication Contracts Negotiated for Authors and Composers. Malone, Ted, Letter, November 19, 1935, KMBC, Midland Broadcasting Company. Roman, Edward W., “All Because of You,” lyrics in Roman’s hand, personal communication, 1936. Roman, Edward W., and Brignola, Almerinda, “Broken Hearts That Weep at Evening,” music in Roman’s hand, personal communication, n.d.
Roman, Edward W., “Broken Hearts That Weep at Evening,” lyrics in Roman’s hand, personal communication, n.d.
Roman, Edward W., “I Am Really in Love,” lyrics in Roman’s hand, personal communication, 1936. Roman, Edward W., “I Gambled and Lost,” lyrics in Roman’s hand, personal communication, 1936. 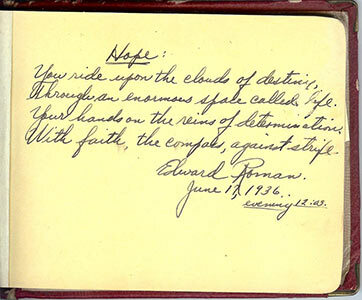 Roman, Edward W., “A New Star Was Born,” lyrics in Roman’s hand, personal communication, n.d.
Roman, Edward W., and Brignola, Almerinda, “Stains of Love,” music in Roman’s hand, personal communication, n.d.
Roman, Edward W., “Stains of Love,” lyrics in Roman’s hand, personal communication, n.d.
Roman, Edward W., Thoughts, March 17, 1936. 98 Acres in Albany (. . .thanks to Barry Levine), “On the Street of Regret,” https://98acresinalbany.wordpress.com/2015/05/08/on-the-street-of-regret/, May 8, 2015. 1934 janus, January class of ’34, n.d.
Blue Moon (1934 song). (n.d.) In Wikipedia. Retrieved March 11, 2019, from https://en.wikipedia.org/wiki/Blue_Moon_(1934_song). “’Blue Moon’ His Brain Child, Claim Of Trojan Seeking Data on Sales: Suit Instituted on Charges Famous Song Was Used Without Permission,” personal communication, n.d.
“’Blue Moon’ Made Author Blue, He Tells Court,” personal communication, n.d. The Dardanian, Annual Publication of the Troy High School, The Class of 1936, 1936. Edward Roman v. Richard Rodgers, Lorenz Hart, Jack Mahoney, doing business under the assumed business name of “Mahoney and Associates,” Metro-Goldwyn-Mayer Corp., and Robbins Music Corp., Supreme Court County of Rensselaer, 1936. Esposito, Mike, “Preparing for the Holidays Fifty Years Ago,” Troy United, http://www.uncle-sams-home.com/tui/199712/a19971201120504.html, 2009. Esposito, Michael A., Troy’s Little Italy (Images of America), Arcadia Publishing, 2009. Freeman, Mary, “Song Writer in Troy Seeking Legal Solace for ‘Blue Moon’: Starts Court Action for Accounting of Royalties on Composition,” The Knickerbocker Press, October 21, 1936. Marmorstein, Gary, A Ship Without a Sail: The Life of Lorenz Hart, Simon & Schuster, 2013. Minogue, Jane, “Blue Moon by The Marcels,” https://www.dailydoowop.com/blue-moon-by-the-marcels/, April 16, 2018. The Nineteen Hundred and Forty Cornellian, The Cornell Annuals, Inc., 1940. Purdum, Todd S., Something Wonderful: Rodgers and Hammerstein’s Broadway Revolution, Henry Holt & Company, 2018. Schwartz, N.B., BLUE MOON and before (compilation), https://www.youtube.com/watch?v=0X7rhlP99OQ, May 10, 2011. “Trojan Suing for Song Cash,” personal communication, n.d.
“Young Troy Musician Wins Highly-Coveted Jazz Award,” The Times Record, 1958. Young, William H., Jr., and Young, Nancy K., Music of the Great Depression (American History Through Music), Greenwood Press, 2005. In addition to unpublished and published documentary sources, I interviewed and/or conversed with the following: Edward W. Roman, late 1950s, n.d.; Christopher A. Brignola, December 1, 1992; Dominick E. Brignola, June 15, 2006; E. Stewart Jones, Jr., November 5, 2014; Kathy T. Sheehan, County and City Historian, Rensselaer County Historical Society, November 6, 2014; Yvonne Brignola, September 18, 2016. I was advised about attorney conduct regarding disposal of materials by Kathleen R. Mulligan Baxter, General Counsel, New York State Bar Association, in an email, November 6, 2014. A framing signal, such as “told me,” announces sources in oral testimony.